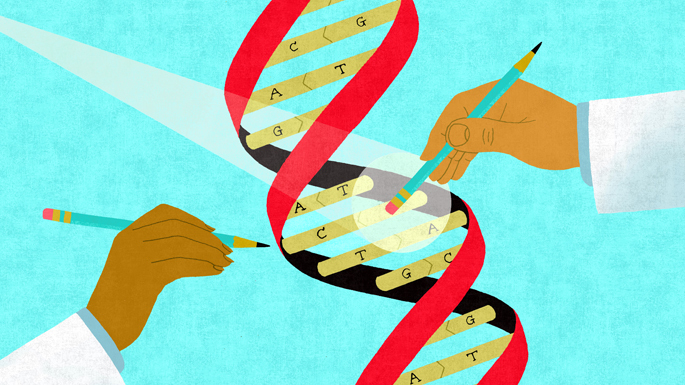 New genetic editing technology has opened the door to erasing the mutations in our DNA. Olson, a molecular biologist and Director of the University of Texas Southwestern Medical Center’s Hamon Center for Regenerative Science and Medicine, responds to all these letters. “I probably shouldn’t, but I just can’t help myself,” he says. His answers vary, depending on which one of 3,000 different genetic mutations is making the boy’s muscles degenerate and his heart slowly fail. There is no cure for Duchenne muscular dystrophy. Caused by a mutation on the X chromosome, it prevents the muscles from producing dystrophin, a critical muscle fiber protein that Olson describes as the body’s “shock absorber,” and without it the muscles deteriorate. It’s degenerative; a healthy baby turns into a boy in a wheelchair, who turns into a young man with a ventilator. Most patients die before their late 20s. And yet, in 2015, Ben Dupree, a 22-year-old from University Park, Texas, who suffers from Duchenne, went up to Olson’s lab and found himself looking at a sample of his own blood that was cured of the disease. The lab scientist, whose shock of white hair and easygoing braininess give him the air of an avuncular — and maybe a little intense — biology professor, was eager to show his patient zero the breakthrough. Using a revolutionary gene-editing technology called CRISPR, Olson had transformed Dupree’s blood sample into cardiac muscle cells, studied the mutation that caused the disease, re-created it in a dish, and then corrected it. In the petri dish, for the first time, Dupree’s cells were generating dystrophin. “Cure” is not a word Olson takes lightly. The process has been proven on mice and larger animals, but clinical trials are a ways off, and there’s further research to be done. Olson’s treatment can only halt the progress of the disease, not reverse it. Gene editing raises other issues. With something as complicated and untested as rewriting parts of the human genome, there’s the potential for unforeseen side effects. And yet, you watch a video of Olson sitting with Dupree, looking at the patient’s largely repaired heart cells on a screen, and you can easily believe that a cure is possible. “You can find the single error in a person’s whole DNA sequence — in their book of life — and you can fix it,” Olson says. If genomes were sequenced at birth, this could be the answer not just to Duchenne muscular dystrophy but to any number of hereditary diseases. About one in every 5,000 boys is born with Duchenne, the most common form of muscular dystrophy. Without genome sequencing, there is no way of knowing the baby is not healthy. But after a few years, the symptoms start. 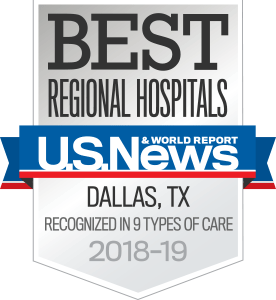 “Usually between 2 to 5 years old, they’re not walking, they’re stumbling,” says Dr. Pradeep Mammen, a heart failure/heart transplant cardiologist and colleague of Olson at UT Southwestern. A child can’t keep up on the playground, or run upstairs. After diagnosis, typically done now by genetic testing or biopsy, parents must decide when and how to tell their children about the disease. Most boys are wheelchair-bound by the time they’re 13 years old. Because Duchenne has weakened their diaphragm, by their mid-teens, patients often need a ventilator or some assistance with breathing. These boys and young men will eventually depend on a caregiver for many tasks we take for granted: going to the restroom, taking a shower, brushing their teeth. About a third of those diagnosed with Duchenne will develop some type of cognitive issue, often autism. Advances in care — portable defibrillators and ventricular assist devices, which help the heart circulate blood — now allow many Duchenne patients to live into their 20s, which was unthinkable as little as 15 years ago. Around 70 percent of Duchenne patients now live into adulthood. New technology has improved quality of life, too, allowing patients to operate their wheelchairs, use computers, and otherwise lead busy lives. Dupree, who saw his muscle cells repaired in Olson’s lab, studied molecular biology at Southern Methodist University and has been applying to graduate schools. He hopes to one day be a genetic counselor. But the disease is always fatal, and there is still no effective therapy for treating the disease itself. Without dystrophin, the heart ultimately disintegrates. When Olson discovered he could fix a mouse embryo that had Duchenne, he began publishing some of his research on a new technique: the first that would treat not just the symptoms of the disease, but the cause. The question of how to translate this into therapy for people with the fatal disease arose. In the fall of 2015, the National Institutes of Health gave UT Southwestern a $7.8 million grant to form the Senator Paul D. Wellstone Muscular Dystrophy Cooperative Research Center, co-directed by Olson and Mammen, and one of only six of its kind in the U.S.
Its purpose, in a nutshell? Find a way to cure Duchenne. Advances in care now allow many Duchenne patients to live into their 20s, which was unthinkable as little as 15 years ago. Around 70 percent of Duchenne patients now live into adulthood. How do you find the cure for a disorder that can be caused by any one of 3,000 mutations? 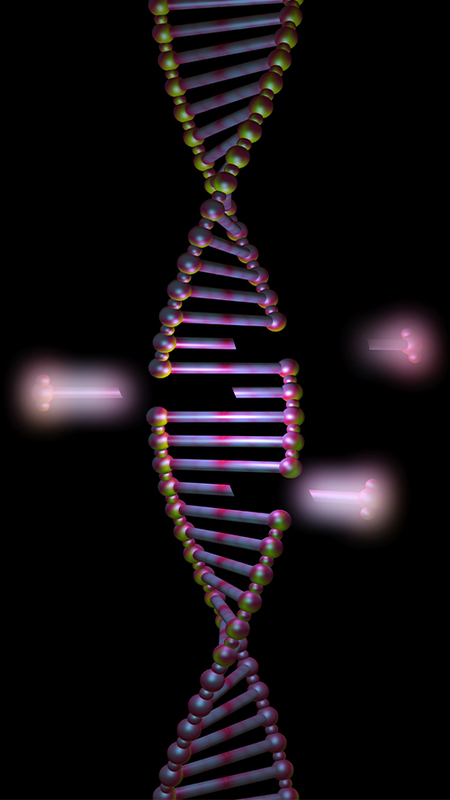 The dystrophin gene is the biggest in the human genome, comprised of a large segment of DNA. The work would be painstaking. The Wellstone Center has integrated with neurologists, pediatric neurologists, and a cardiologist to make contact with Duchenne patients and get blood samples. Because every patient could have a different mutation in the gene, the trick was to make different RNA guides to tell the CRISPR where to cut to repair the gene. The damage that could be caused by an irresponsibly used DNA slicer is what led James Clapper, then the U.S. Director of National Intelligence, to label gene-editing tools like CRISPR a potential “weapon of mass destruction and proliferation” in 2016. That’s not even wading into some of the ethical dilemmas posed by such a radical new biotechnology. Will it be possible someday to in effect create “designer babies,” engineering humans to run faster, or to have a certain eye color? If the technology continues to progress, could you edit an entire species into nonexistence? Curing a boy’s fatal disease is one thing. What about correcting his mother’s DNA so that she does not pass down the inherited disorder in the first place? Olson’s lab is firm on that line. Treating the patient who has the disease means changing their DNA in the tissue affected (in this case, the muscles). Germline editing — treating the mother who carries the disease — is a different beast. But the potential for misusing gene-editing technology isn’t stopping the money and research being poured into exploring how CRISPR can be used in any number of fields. Imagine crops genetically engineered to endure the effects of climate change, renewable biofuel extracted from algae, or extinct animal species re-created from genes found on fossils. Imagine, as Olson did, how the technology could be applied to patients with Duchenne. Using a revolutionary gene-editing technology, Dr. Eric Olson can correct the mutation that causes Duchenne muscular dystrophy. When Olson’s lab hit on the idea that the vast majority of mutations that cause Duchenne could be found among 12 “hot spots” in the dystrophin gene, they blew open the possibilities for developing the right guide RNA. With extreme precision, the CRISPR-carried enzyme makes a cut at strategic points in the patient’s DNA, editing muscle cells so that they can produce dystrophin. In this case, the enzyme is cutting away what amounts to a genetic “stop sign” (that’s Mammen’s analogy) that prematurely stops the production of dystrophin. Olson and his team succeeded in doing this in a dish with Ben Dupree’s cells. But those are isolated cells in a dish. To test the treatment in mice, Olson’s lab needed to develop a harmless virus that could spread the guide RNA and enzyme throughout the body’s muscle tissue. Ideally, the virus they developed will find more cells that have the Duchenne-causing mutation being targeted and fix all of them. “The hope is that it will find every cell,” Olson says. In mice, treatment has restored dystrophin production in more than 80 percent of muscle cells, enough to effectively stop Duchenne. More recent tests in larger animals have been similarly successful. Much of the challenge now is in scaling up. Olson launched a new biotech company, Exonics Therapeutics, to expedite that process. Funded by a $40 million investment, the company is working to develop the discoveries made in his lab into new gene-editing drugs for Duchenne. In a perfect world, 10 or more years down the road at the very least, pediatricians will be able to catch the disease early. A boy with Duchenne will have his genome mapped to identify the specific mutation causing the disorder, to find the one DNA letter containing the fatal error. “This is the classic example of personalized medicine,” Olson says. That boy will be injected with the CRISPR-carrying virus before any of Duchenne’s worst effects take hold. In this perfect world, the research in Olson’s lab will encourage and coincide with breakthroughs in gene-editing treatments of other monogenic diseases, and we’ll begin to see some of the world’s most intractable disorders cured. It’s not a perfect world, but that’s never stopped scientists and doctors from trying. Olson, a member of the National Academy of Sciences and the National Academy of Medicine, has dedicated his career to studying muscles. He and his team’s stem cell research has led to often stunning advances in the field of regenerative medicine, and Olson’s work is recognized around the world. He hasn’t escaped notice at home in Dallas — invited in April to speak at the George W. Bush Presidential Center for a forum on subjects that “will help reshape the coming decades,” he was among a select group that also included Jeff Bezos and Condoleezza Rice — or recognition from one of his musical heroes, Willie Nelson. More than 10 years ago, Nelson led a concert benefiting Olson’s work, and Olson now holds the endowed Annie and Willie Nelson Professorship in Stem Cell Research at UT Southwestern. A picture of Olson with Nelson on the Red Headed Stranger’s tour bus hangs in his office at UT Southwestern, along with other Nelson memorabilia and a poster for Olson’s own band, the Transactivators, which is named for the proteins involved in gene regulation. Olson plays guitar and harmonica alongside his bandmates, other North Texas scientists and researchers. The Transactivators have gigged around Dallas and other parts of the country, and played a set at UT Southwestern in May for the school’s 75th anniversary. Rock star moonlighting aside, Olson’s work toward a cure for Duchenne, the “holy grail” of muscle disease, feels like a natural, ambitious step in a remarkable career. It also means the lab scientist is spending more time than ever before with patients. Olson has taken to the role, attending meetings of patient advocacy groups and responding to all those letters, from families desperate for a cure. When Olson does media interviews with Dupree, his patient zero, the reporter nearly always asks Dupree how it feels to know that this revolutionary CRISPR treatment is years away from being ready for human application. How does it feel to know this won’t save you? Dupree takes comfort in the knowledge that he’s part of an effort that could save the lives of thousands of other young men and boys. Meanwhile, the messages continue to pour in, the letters from the mothers whose sons are dying. Olson can’t give their sons a cure. Not yet. But he can give them something else. He can give them hope. When speaking to the public and reporters about CRISPR, scientists like to use simple analogies. You’ll often see it compared to the “find and replace” function in a digital word processor. There are two components to CRISPR: the Cas9 protein enzyme and the guide RNA. Dr. Rhonda Bassel-Duby, a Professor of Molecular Biology at UT Southwestern and a member of the Wellstone Center, refers to CRISPR as “genetic scissors,” a much better alternative to reading out what the acronym stands for: clustered regularly interspaced palindromic repeats. CRISPR techniques first picked up steam in 2012, as a system of tools — largely inspired by and riding on a natural bacterial immune system — to direct an enzyme with the ability to alter a genetic DNA sequence. These enzymes do the actual cutting of DNA strands. The most commonly used enzyme is called Cas9, although scientists continue to patent new enzymes, in a dizzying array of acronyms and numbers: Cpf1, Cas13, CasX. And because every cell in the human body has about 3 billion letters of DNA, or the equivalent of 1,000 Bibles stacked up (that’s Olson’s analogy), you need a sort of GPS system (that’s Bassel-Duby’s) to ensure that the gene-editing enzyme goes to the right place. This navigational system comes in the form of a guide RNA, which is delivered through the body with the “scissors” on an inert virus. The RNA sequence will find its complementary DNA strand, and scientists can customize an RNA guide to go to the precise DNA sequence they’re targeting. Like, for example, to the mutation in the gene that creates dystrophin. Since Duchenne is a monogenic disorder (caused by a mutation on one gene), it is ideally suited for CRISPR treatment, which acts like genetic scissors to cut through offending mutations and carry the correction through the natural bacterial immune system, altering the person’s DNA. Other monogenic disorders that could be treated with CRISPR include Huntington’s disease and sickle cell anemia.